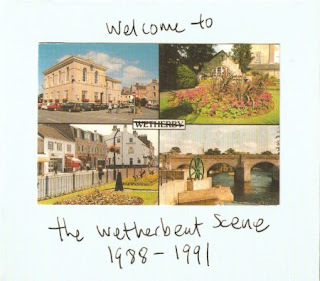 "The Wetherbeat Scene" is a 36-track compilation released by 555 Recordings, formerly of Leeds, now based in Flagstaff, Arizona. It documents the small scene that developed in the Yorkshire town of Wetherby, leading eventually to the founding of 555. I was initially attracted to this release because it features some early tracks by Hood, although it's difficult to reconcile the chaotic, Pavement-like racket with the atmospherics that Hood have released in the last few years. (They are one of the few bands where I actually think their later music is better.) If you're familiar with Hood's early releases such as "Cabled Linear Traction" or the singles compiled on "Structured Disasters" then you should have some idea of what to expect, but the tracks featured here are more shambolic still and I think it's safe to assume that most of them were recorded in somebody's bedroom. As you'd expect with a 555 compilation, there are a number of Boyracer tracks, including a hilarious take on Run DMC's "It's Tricky", which appears as the final, unlisted track on the CD. I always find Boyracer enjoyable, but I'm not sure if I really need any more of their songs. I already own something in the region of 200 Boyracer tracks and I'd probably struggle to identify at least half of them if they were played to me blind. One day I'll find time to sit down and listen to their entire back catalogue properly. Apart from Hood and Boyracer, I hadn't actually heard of any of the other bands on the CD and I suspect most of them never went on to record anything else. The most prolific band on the CD, with 10 songs, is Baby Doll Lounge, whose members later formed Boyracer. 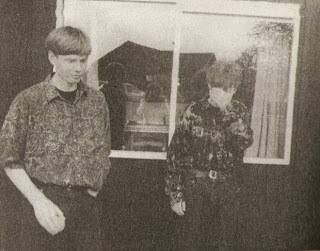 Their music is typical light-hearted late-'80s indiepop, and if their song titles are anything to go by, they were influenced by The Wedding Present. You can easily imagine titles like "You Don't Have To Say Yes" or "Why Should I Communicate With You?" appearing on an early Wedding Present release, and just in case we haven't got the message already, they also have a song called "I Stood Next To David Gedge In Jumbo Records". However, their cover of Primal Scream's "Velocity Girl" seems unnecessary, as it is barely distinguishable, to my ears at least, from the original. Other bands on the CD include The Liddles, The Harbour Pilots and The Paisley Springtime. I can tell you very little about any of these bands, and Google only comes back with, respectively, a medical disorder, maritime job vacancies and some curtain material. That, in case you're wondering, is an early shot of Richard and Chris Adams of Hood. I find that picture particularly touching, because when I was at school in the late '80s, everyone I knew looked like that. 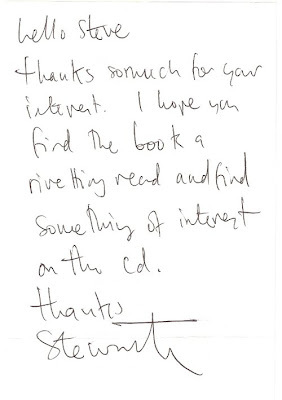 Although much of the music included is rather amateur in both style and recording quality, it has a certain endearing nature and, combined with the book, it makes a great historical artefact. Fans of Sarah Records and the like, or modern-day tweecore such as The Pains Of Being Pure At Heart, will certainly enjoy the youthful enthusiasm found here.